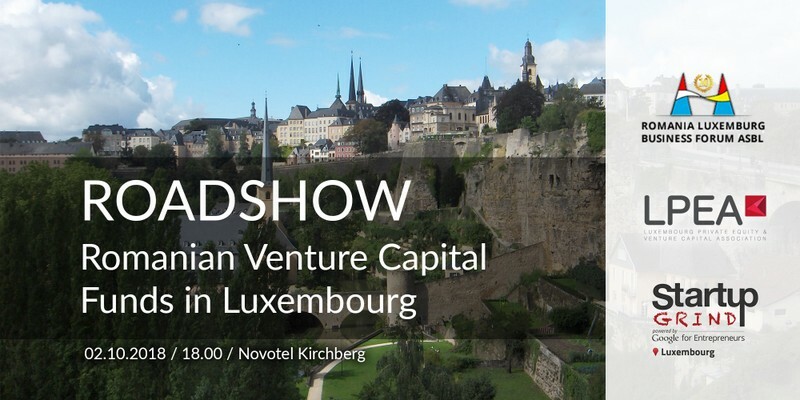 LPEA and RomLux invite you to the first ever road-show in Luxembourg dedicated to 3 most successful Romanian Venture Capital funds: Gecad Ventures, GapMinder and 3TS-Catalyst Romania. The event will showcase the investment opportunities in the Romanian start up scene that recently saw its first unicorn unfold: UiPath – robotic automation. It will also cast a light on the most successful venture capitalists and serial entrepreneurs in Romania as well as introduce them to Luxembourg network of private investors, business angels, venture capitalists, fund of funds, private bankers and family offices. Romania has a distinctive technological ecosystem being the third global market for quality and speed of Internet connectivity. Currently, Romania is also the fastest growing European country. The funds invited are the most fruitful ones in Romania with successful exits like: Vector Watch sold to FitBit, Rav Antivirus sold to Microsoft, Coinzone acquired by Coinify, Avangate sold to Francisco Partners but also with active investments in elefant.ro, leading Romanian e-commerce platform or typingDNA, a behavioural biometrics SaaS. 3TS Capital Partners provides expansion capital and buyout funding for small and medium-sized businesses in growth sectors including Technology & Internet, Media & Communications and Technology-Enabled Services. Investors in the current and past 3TS funds totaling over €300 million include EIF, EBRD, Cisco, OTP, Sitra, 3i and KfW among others. GapMinder is a Venture Capital Fund, targeting IT Software and Services start-ups in Romania and Central Eastern Europe. In a dynamic and growing start-up ecosystem, GapMinder is committed to support passionate and thoughtful founders to become global entrepreneurs and to rewrite the place of Romania in the global tech arena. Besides the tremendous investment opportunities offered currently by these VC funds in particular and by Romania in general, most of the partners of these three VC funds are successful serial entrepreneurs with an established track record and important financial means. Therefore we see potential synergies in finding common opportunities that could result in your direct and immediate benefit. ROMLUX Asbl was created in 2007 to encourage the development of economic, cultural, scientific and diplomatic relations between Romania and the Grand Duchy of Luxembourg. The REN (The Romanian Entrepreneurs Network in Luxembourg and in the Greater Region) is one of Romlux’s most important initiatives in recent years. The REN series was launched in 2013 to support the Romanian entrepreneurship in Luxembourg and in the Greater Region. The main goal is to create and maintain a communication and collaboration platform dedicated to entrepreneurs in order to support each other and to promote the businesses based on Romanian capital, values or human resources. Please confirm your presence to the event by September 30 at info@romlux.org or online to http://REN2018VCFunds.eventbrite.com.